Could you do with a trusty consultative companion by your side? 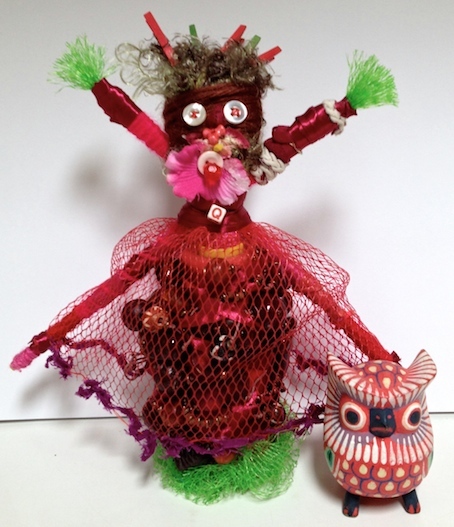 Qinka – Creative Spirit has found her Owl. She didn’t know she needed one until it/he/she turned up in an op shop. This Owl does not yet have a name. Please can you help us name Qinka’s owl? You can leave a suggestion in the comments box below, or the speech balloon above. We eagerly await. We have a name for Qinka’s Owl. It is Qoot. Inspired by a raft of suggestions from Louise Jade. Thank you, Louise. Qinka has reconnected with her long-lost cousin, who does have a name. The lovely Susan Golden was so inspired by Qinka’s appearance in the Art Therapy + Happiness Project that she created Kaniq – Qinka’s cousin. (note that Kaniq’s name is composed of the same letters). ∞ Creativity generates creativity in the Creative Love Exchange. ∞ You do not need to feel alone on your creative journey. How might YOU seek support for your creative growth and nourishment? ∞ Feel free to ask Qinka a question about your creativity and listen for her response. You are likely to hear it in your heart. If not, feel free to ask the question right here in the comments section. Your question and Qinka’s reply can be up to 50 words each. At last! The result of the Pronunciation Poll. You came, you saw, you voted. Qinka is pronounced….Kinka with a K.
As opposed to a Qu. You can view the poll here. 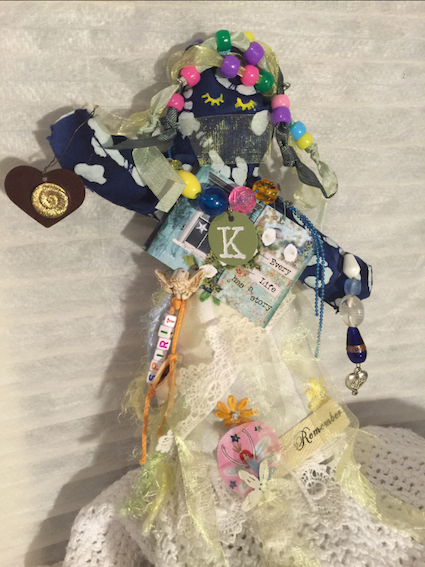 This entry was posted in creative love exchange, Creative Support, Muse and tagged Art Therapy + Happiness, Creative Love Exchange, creative spirit, inspiration, muse, Qinka by Art and Soul Space. Bookmark the permalink. I love the idea of having a Quinka 😉 What a lovely concept ! Thank you, Jacqui. I hear that Qinka is ready and willing to answer your creativity questions…or perhaps you have your own Qinka? Dear Qinka and Qoot I have a question for you both. I am stuck at home and in bed a lot of the time, feeling a bit ‘under the weather’. How can I have an artist’s date without leaving the house? Qinka and Qoot are currently in an altered state from sniffing springtime jasmine. Perhaps this is a clue to answer you…? Qinka and Qoot are at home, seemingly immobile, yet they are deeply involved in their inner artist date-style travel. You might not see Qoot flap his/her/its wings, but he/she/it is flapping inner wings of sensory delight. No finer artist date. He he. Thank you Qinka and Qoot. Inner wings eh? I’m pondering and sniffing the breeze…will get back to you with the results.